Researchers have developed a live-cell-imaging-based system that provides molecular and biomechanical insights into how Lyme disease bacteria latch onto and move along the inside surface of blood vessels to reach key destinations in the body where they may be able to persist longer and avoid treatment. Ironically, the same strategies that these bacteria use to spread through the body are also used by immune cells to protect against infectious disease. The study appears August 25 in Cell Reports. "There is very little known about the biomechanics of bacterial-vascular interactions, even though understanding this is really important for understanding how bacteria spread through the body via the cardiovascular system, and for developing methods to block bacterial dissemination," says senior study author Tara Moriarty of the University of Toronto. "Our in vitro live-cell-imaging-based system will permit more efficient dissection of the underlying interaction mechanisms and more rapid screening for inhibitors of bacterial-endothelial interactions and dissemination." 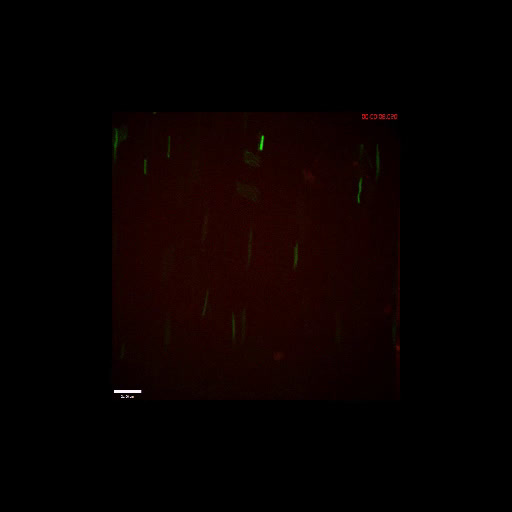 Moriarty and her team developed a flow chamber system and real-time tracking methods that enabled microscopy analysis of bacterial interactions with human endothelial cells lining the surface of blood vessels. Using genetically modified strains of the Lyme disease bacterium (Borrelia burgdorferi), the researchers discovered that a cell-surface adhesion protein called BBK32 plays an important role in stabilizing and strengthening bacterial-vascular interactions under flow. By calculating the displacement of bacteria from the endothelial cells, the researchers also found that the microbes use bungee-cord-like tethers to stabilize and strengthen these bonds. 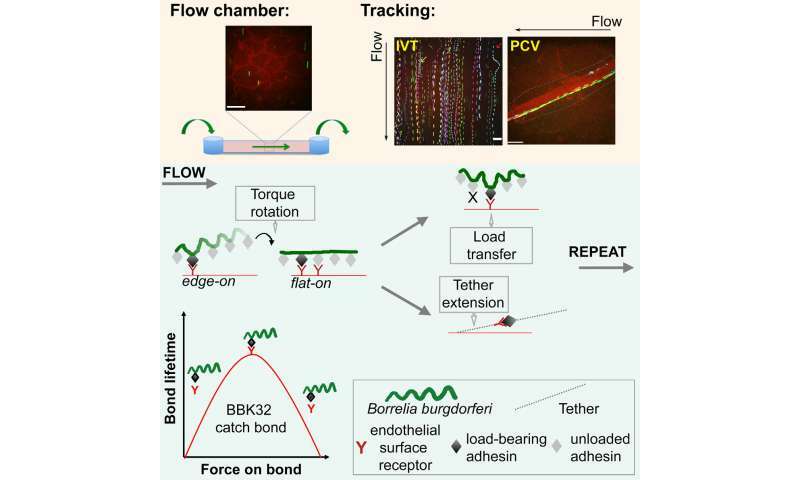 Using their imaging-based system, the researchers went on to discover that bacteria move along endothelial surfaces under flow by transferring mechanical load along a series of successively formed and broken bonds. Similar to children swinging on monkey bars, the bacteria transferred force from one bond to the next without fully detaching, slowing down every time they established a new bond and accelerating when they broke a bond and transitioned to the next one. This repeating cycle allowed the bacteria to stably move over the endothelial surface at a constant overall speed, similar to the way immune cells called leukocytes move through blood vessels. Additional calculations revealed that the propulsive force generated by bacterial motility is stronger than the forces imposed on bacteria by flow, suggesting that the microbes may use rotating internal structures called flagella to actively migrate along blood vessel walls and exit the vasculature to reach specific tissues, even under the force conditions generated by blood flow. The entire process is similar to humans swimming down a river, using their legs to move toward trees lining the bank, grabbing onto a series of branches to slow down, and eventually pulling on the branches while kicking to exit the river and reach dry land. "The ability of Lyme disease bacteria to disseminate using the network of rivers and streams provided by the bloodstream, and the ability to catch onto the banks of these rivers and streams, would likely be very important for spreading throughout the body, because they can overcome the barrier to dissemination caused by blood flow," says first author Rhodaba Ebady of the University of Toronto. "It's likely that this property helps the bacteria get to sites where they might be able to persist longer, and this property might therefore make it harder to treat infections caused by these bacteria." The findings also suggest that drugs targeting BBK32 or as-yet-unidentified endothelial receptors could help to prevent or slow down the spread of Lyme disease bacteria to joints, the heart and the nervous system, thereby eliminating or reducing the severity of symptoms such as arthritis, heart inflammation, facial paralysis, and nerve pain. Because BBK32-like proteins are also produced by pathogens such as Staphylococcus aureus and Streptococcus pyogenes as well as certain Borrelia species, the findings could also be relevant to other serious conditions caused by blood-borne spread of bacteria, including pneumonia, relapsing fever, and inflammation affecting the heart, bones, and nervous system. Moreover, currently available drugs that inhibit leukocyte-vascular interactions for the treatment of autoimmune and inflammatory diseases could potentially be repurposed for Lyme disease and potentially other infectious diseases. In future studies, the researchers will attempt to identify the endothelial receptors that BBK32 interacts with, assess the biomechanical role of bacterial flagella in vascular interactions and dissemination, and try to determine how bacteria target specific endothelia associated with different tissues. More broadly, their cell-imaging approach could be used to study how other pathogens spread through the body. "We really hope that other labs can use some of the approaches we've established to study other bugs and will be glad to help other groups do this," Moriarty says. "There's so much to do, and all we've seen so far is the very tip of the iceberg."